A graphene layer (black) of hexagonally arranged carbon atoms is placed between two layers of boron nitride atoms, which are also arranged hexagonally with a slightly different size. The overlap creates honeycomb patterns in various sizes. Image: Swiss Nanoscience Institute, University of Basel. Combining atomically thin graphene and boron nitride layers at a slightly rotated angle changes their electrical properties. Physicists at the University of Basel in Switzerland have now shown for the first time that adding a third layer can result in a new set of properties. This significantly increases the number of potential synthetic materials, report the researchers in a paper in Nano Letters. Last year, researchers in the US caused a big stir when they showed that rotating two stacked graphene layers by a ‘magical’ angle of 1.1° turns graphene superconducting – a striking example of how combining atomically thin materials can produce completely new electrical properties. Scientists from the Swiss Nanoscience Institute (SNI) and the Department of Physics at the University of Basel have now taken this concept one step further. They placed a layer of graphene between two boron nitride layers, which often serve to protect the sensitive carbon material. They then aligned the boron nitride layers very precisely with the crystal lattice of graphene. The effect subsequently observed by the physicists in Christian Schönenberger's team is commonly known as a moiré pattern: when two regular patterns are superimposed, a new pattern results with a larger periodic lattice. Lujun Wang, a member of the SNI PhD School and a researcher in Schönenberger's team, observed this kind of superlattice when he combined layers of boron nitride and graphene. The atoms are arranged hexagonally in all the layers, and so when they are stacked on top of each other, larger regular patterns emerge, with the size depending on the angle between the layers. Previous studies had already shown that these moiré superlattices can be produced by stacked layers of graphene and boron nitride, but the effects of adding another boron nitride layer had not been determined. 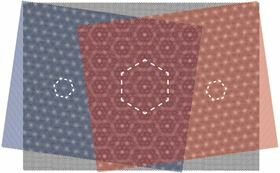 When the physicists from Basel experimented with three layers, they found that two superlattices were formed between the graphene and the upper and lower boron nitride layers, respectively. The superposition of all three layers created an even larger superstructure than possible with only one layer. Scientists are very interested in these types of synthetic materials, since the different moiré patterns can be used to induce new electronic properties in the materials. "To put it simply, the atomic patterns determine the behavior of electrons in a material, and we are combining different naturally occurring patterns to create new synthetic materials," explains Andreas Baumgartner, who supervised the project. "Now we have discovered effects in these tailor-made electronic devices that are consistent with a three-layer superstructure." This story is adapted from material from the University of Basel, with editorial changes made by Materials Today. The views expressed in this article do not necessarily represent those of Elsevier. Link to original source.